The Customize Windows > Wordpress and SEO > SEO tips > How to choose a domain name? Your domain name gives a first idea, a taste of the content of your website. You should not underestimate your choice of domain name which is a communication tool. This is important. We thought several days to find a good domain name for our other website. It should be noted that the algorithms of search engines do not all work the same way. For Bing and Yahoo keywords in the domain name have an important weight, while Google focuses on other criteria for SEO . Blog statistics reveal that 93.79% of users found any blog through Google, 3.00% via Yahoo, and only 0.86% from Bing. Although Google is carving out the lion’s share, you should not neglect its competitors. Using keywords in its domain name is a good choice. Especially when other users give a link (backlink) to your site. Some says that the choice of the extension of the domain name (. com,. net, .org, etc.) is one of the best solutions for the site is properly referenced in the countries concerned. Not only the search engines take into account the extension of the domain name (Google associates the extension to a particular region of the World), but they also take several other factors: the geo-location of the server site, the origin of backlinks (backlinks to the site), the language used in the site, etc. Imagine a site with a pie chart divided into several parts. For the site has good visibility in the SERP, each criterion in SEO, no matter how small it must be important. Each criterion SEO is the small stone that helps to build the block. The domain name extension – generic top level extension – gives an idea about the nature of the site (its content, its provenance). Soon you will see new extensions that will clarify the content of a site. there will be sectoral TLDs (.sport, .music, .bank, …) and even TLD accented characters (Chinese characters, Cyrillic, Arabic etc.). We used the term “identity” because it includes several ideas that will popularize a site. This factor is intended to cover the man, that is to say its faculty and its visual psychology. Human generally uses his visual sense during web surfing, he visits the lists of search results and, ultimately, it will retain more or less the domain names of sites he visited. It raises the question: what are the names of domains that the user can better remember? One example among others: what is the domain name www. example . com is harder to remember than www. e-xam-p-le . com? It is better to use no more than 3 keywords. They must be legible, descriptive and easy to save (with or without dashes). If the name of your store of greeting cards is such Booboo, use it for your domain name (if not already reserved). Who knew for Google, who would have thought for a moment that was to become the leader of the search (except sponsors)? You are ambitious? Use a keyword to remember. Domain names like chocolate-pastry-enterprise . com is too long, avoid them. Use 20 characters (maximum) to keep things clear. 10 characters for a domain name is a good choice. Avoid using acronyms and initials that may be confusing to the user if the abbreviation / acronym is unknown. Then why you named your website TheCustomizeWindows? CustomizeWindows itself a parked website. We were desperate to get CustomizeWindows at lower cost, because our previous website’s name was CustomizeWindows . co . nr. We got this name nearest to it. You can add “The” if your brand named website is parked or used otherwise. We thought we would write tutorials for Windows OS only and post Customization resources. However, it has extended to Computer in general including Cloud Computing, Virtualization and Blogging, SEO, WordPress tips too. Because of the big name we give importance to branding : look at our header banner : it is bigger than usual size, very vibrant. So, our domain name is actually a misnomer now. But, as you can guess, it is almost impossible to change the current domain name without affecting our offsite SEO. 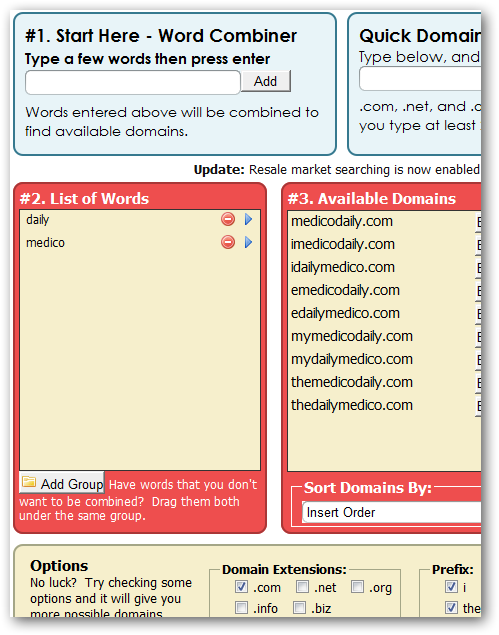 There are many online free tools available to suggest domain names. We personally like Bust a name as it offers various combination, keywords, prefix etc. This Article Has Been Shared 5243 Times! Articles Related to How to choose a domain name? Title: How to choose a domain name? Cite this article as: Abhishek Ghosh, "How to choose a domain name?," in The Customize Windows, March 14, 2011, April 18, 2019, https://thecustomizewindows.com/2011/03/how-to-choose-a-domain-name/.